I am a sucker for a good memoir. I love the glimpse into a life of another, the stepping into their shoes for a few hundred pages, the moments of high drama mixed in with the quirky minutiae of the day-to-day. Whether it’s the lives of the great and good or a meandering tale of travels or toils, if it’s well written I am totally on board. I’ve followed Emma Beddington on twitter for a good long while, which took me in turn to her super blog, Belgian Waffling. I love her writing, full of heart, and humour, and pop culture / culture culture references which are exactly where I like them to be – a little low, a little high, a little in the middle. I write as someone who enjoys The Real Housewives of Beverley Hills, books on Platagenet history and Austen in equal measure. I like to mix it up, and Emma’s blog has much to enjoy if you like to learn, while also enjoying plenty of cultural touchstones you know well. As a fan of Emma’s blog, I was delighted, then, when she tweeted that she’d be writing a book. When some bloggers make similar proclamations I’m chuffed for them, but I know I won’t be reading the finished article, because their blog seems to be their outlet, with not so much left to say. No bad thing, but a definite stopping point for purchasing a book. With Emma the opposite was true and as soon as pre-orders opened I bagsied myself a copy. It was released last week and I read it as soon as I could. Remarkably quickly. This is a great book. Funny, witty, wry; but also silly and touching and clever and emotional. Emma is a spectacular writer and the joie de vivre and piquant observations and humour of her blog translate beautifully to the pages of a book. In much the same way that Jenny Lawson’s books match her personality and the tone of her blog, Emma Beddington’s book is unmistakably her – the same authorial voice and cultural timbre is at work here. It’s lovely to have a longer time to spend with Emma as she leads her readers through the ups and downs of her teens, twenties and thirties. 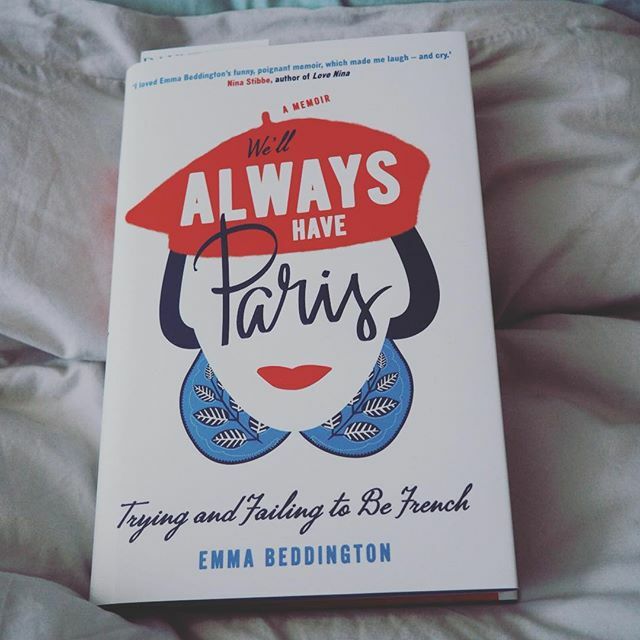 From a teenage obsession with French Elle magazine, Emma is full of ambitions to become French and to fully embrace the many quirks and ways of la vie Francaise. As the book unfolds we see some of those dreams realized and others dashed as Emma navigates the milestones and millstones of life. I really enjoyed the honesty of the book – in some memoirs there’s a huge knack for glossing over or sugarcoating situations, but here Beddington shares honestly, even when situations or occurrences were unpleasant or difficult. The passages dealing with loss were genuinely moving and summed up for me quite brilliantly the sorrow and emptiness that these seasons of grief can give us. I loved as well the vivid pictures she painted of her cast of characters; from her loving and able descriptions I really feel I have a sense of her loved ones. I also adored how Emma made you really feel like you knew the places she visited – the areas in London she visits I know well, and she evokes them beautifully – the sounds, smells and sights of the city are beautifully realised. She has a real eye for details and descriptions….and plenty of passion for baked goods too. I thoroughly enjoyed this book and devoured it like an excellent flan or a choice pain au chocolat. If you like books which take you away to different climes, tales of redemption and self-discovery, or just a good, fun read, I’d highly recommend We’ll Always Have Paris.